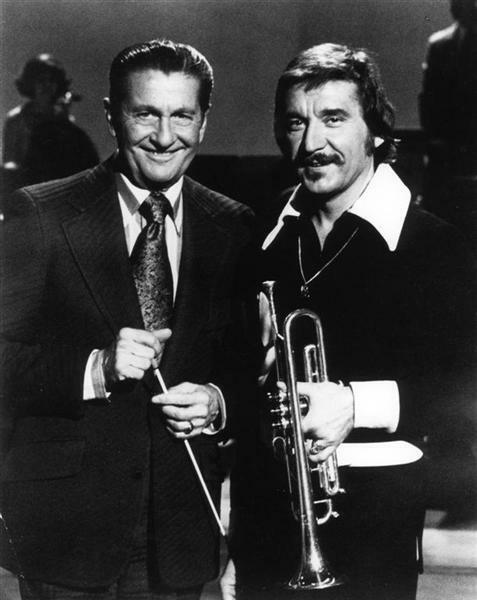 Appearing in March 2011, Doc Severinsen hosts a collection of big band classics from the "Lawrence Welk Show," including his January 22, 1972 visit to the music showcase. Included in this special is Severinsen's rendition of the Oscar-winning song, "Love Story." And the Welk Band salutes the conductor of "The Tonight Show" Band for Johnny Carson with a performance of his signature song, "Johnny's Theme." This special episode pays tribute to 25 legendary bandleaders including Glenn Miller, Tommy and Jimmy Dorsey, Benny Goodman, Les Brown, Count Basie, Ben Bernie, Artie Shaw, Clyde McCoy, Pete Fountain, Harry James, Bob Crosby, Sammy Kaye, Ted Lewis, Duke Ellington, Paul Whiteman, Ray Anthony, Doc Severinsen and many others. This episode was recorded at the Cicada Restaurant in Los Angeles, California, a beautiful Art Deco room, with its original decor of dark wood cabinetry and, appropriately, a large crystal chandelier.